Happy Monday! Today’s Manicure Monday post is simple and sweet, and not just because it smells that way. Revlon’s Spun Sugar is a scented polish, so I deliberately kept it plain to keep the scent from being covered up. I’m wearing three coats of Spun Sugar without top coat. Spun Sugar is a warm metallic gray polish. THe application process was quite nice. The product formula was on the thinner side, but still provided even and full coverage in one to two coats. Unforunately, there are still lots of visible brushstrokes, which I don’t mind, but I know a lot of people aren’t into that. Some may also dislike the ball-top brush cap, it can be weird to hold at times. It dries with a metallic finish, not unlike that of OPI’s Push and Shove or Essie’s No Place Like Chrome, but isn’t as reflective. The scent is quite strong, even after many hours, and smells like a warm spicy perfume. I always feel super-weird wearing things without top coat. I really do rely on it, not just for protecting my color, but also protecting my nails. I have these very soft and bendy nails, and I like a solid, rigid top coat to give them a coat of armor. When I say I’m not wearing top coat with this mani, that’s a little bit of a mistruth; I’m actually wearing it under the last coat of my color. I put down two coats of Spun Sugar, a coat of Seche Vite, and another coat of Spun Sugar to finish the look. This way I have the protection and durability top coat affords me, but I also preserve the finish and the scent offered by the polish. Win/win! Spun Sugar is sold wherever Revlon is sold; I got mine at Walgreens, and I see them on sale there a lot. The infinity loop charm and other charms are sold at Daily Charme. 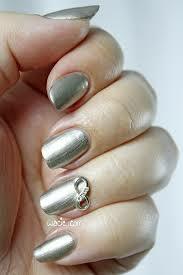 This entry was posted in Manicure Monday and tagged metallic, nail charms, Revlon, scented, silver.